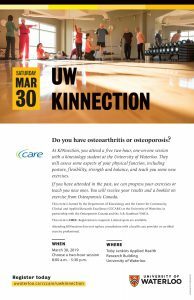 If so, come attend a free two-hour, interactive event with kinesiology students at the University of Waterloo. Get assessed for key aspects of your physical function including: posture, flexibility, strength and balance. Learn some new exercises and go home with your results and a booklet on exercise from Osteoporosis Canada. Download Event Flyer. When: Saturday, March 30 from 8 am to 5:30 pm. This event does not replace consultation with a health care provider or certified exercise professional.